Does your sump pump have what it takes to prevent basement flooding, even in severe conditions? Will it still work when there’s a power outage? With a sump pump from Basement Systems, you can count on reliable, long-term performance. 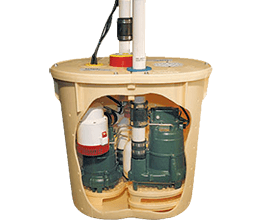 Our basement sump pump systems combine innovative features with top-quality components. Powerful, premium-quality Zoeller sump pumps easily outperform other models. Super-durable plastic sump liner provides clean appearance and helps prevent sediment build-up. Pump stand elevates intake to avoid clogging the pump. Airtight lid improves safety, appearance and compatibility with radon abatement systems. Battery backup capability keeps system operating during power outages. Triple the protection - Keeps your basement dry with three reliable pumps, including a battery backup pump. Non-clogging cast-iron Zoeller pump quietly and effectively removes up to 2,650 gallons of water per hour. 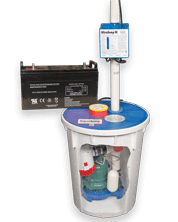 Battery-operated backup pump turns on automatically during a power outage or if primary pump fails to run. A sump pump is critical for keeping your basement dry. This is especially true if your home is prone to flooding. A sump pump helps prevent basement water problems by carrying excess water out of your basement and away from your foundation. If your sump pump isn't working properly, this can lead to excess moisture in your home, which can cause mold and mildew problems. If you have a dirty, open sump pit and under-powered sump pump, then you probably know that this old-fashioned system isn't just ugly; it's also prone to all kinds of problems that can cause basement flooding: a pump intake that becomes clogged with debris and sediment in the sump pit, switch that malfunctions and pump that burns out just when it's needed most. Basement Systems' sump pump systems have been installed in thousands of homes throughout the United States and Canada. Our basement waterproofing systems provide you with the best performance and value and with a finished appearance that you can be proud to show off in your basement. When you install a Basement Systems sump pump system along with one of our patented perimeter drainage systems, you get a dry basement warranty you can count on for as long as you own your home. 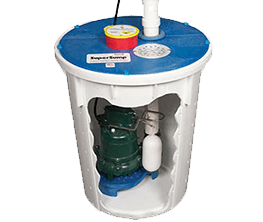 Our innovative sump pump systems are installed exclusively by Basement Systems contractors. Contact us today to request a consultation and estimate for your basement sump pump replacement or installation.